Whether this is on your radar or not, Kratom extract is the product all Kratom tea drinkers can rely on when it comes to potency and quality. However, when a customer discovers a vendor who really cares about the consumer, then all of their products, not just the extracts, but the other Kratom powders, CBD oil, vape, soaps, etc. also become an influential part of their daily routine because of the quality. There are so many people who commit to the power of botanicals to supplement their overall wellness – such as it should be. If you already have a vendor that you trust and delivers, it’s time to ask them about Kratom extract, which is a different animal than simply Kratom. Extract is fundamentally Kratom powder, just more powerful and potent. One can begin to see the potentials and advantages from the very first time they try it. There are many things about extract which keep bringing people back for more. We want to share some of these interesting ideas about this botanical superhero. At some point, you may see a vendor share their extract with the world by adding a number with an “X” beside it. This constitutes the grading system extract goes through during the creation process. You may see a product advertised as 1X, 20X, or 50X. While your brain may want to force you to believe the number and letter means this potency is multiplied by whatever number precedes it, but it doesn’t mean that what you are buying is 50 times more potent than regular Kratom. This simple multiplication factor is showing you the concentration by volume. In other words, our 50X Red Crystal extract means that 50 kilos of Kratom has been reduced down to one kilo of extract. It doesn’t necessarily represent the potency of the extract itself, but it does indicate it is stronger than powder alone. For those who enjoy using Kratom extracts every so often, the following is something to consider. As you know, extracts are usually priced a little more than regular Kratom powder, and for good reason. A great extract shares a LOT of volume of Kratom in a smaller dose. However, sometimes vendors will mislead the customer by mislabeling the product. For example, you will be paying for an extract labeled 20X, but only receiving 5X. Trusted vendors will always share the correct product information and the best way to tell if a vendor is trusted is to look at their customer base. Happy customers equal great products and it brings the masses to testify to their greatness. The beauty of extracts is you should be getting as much per volume of regular powder as you would for a smaller amount of extract. Don’t let a small amount of extract make you believe you are getting a small amount of Kratom. Remember your multiplication grading factors and keep this in mind when you are trying extracts for the first time. Always start with a smaller amount and work your way up. 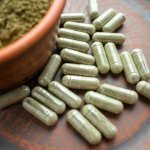 While Kratom extracts are an effective way to supplement your daily routine every so often, the one thing to remember with extracts is that they can greatly increase your Kratom tolerance levels. It is not recommended for a Kratom tea drinker to dose with extract consistently. As you already know with Kratom tolerance, it’s important to switch up even your regular Kratom powder dose from time to time. The same goes with extract, take a pause when drinking/dosing your extract. One cannot say for certain how many times is too many times, but your body will know. If you do encounter a raised tolerance, it will be noticed throughout the entire Kratom family strain, not just extracts. Extracts can be a welcomed addition to your arsenal, if used correctly and with understanding. Kratom extract is a great way to experience high potency Kratom at the same price, but there are responsibilities that come with keeping extracts in your cupboard. The Kratom tea drinker who understands the power of extracts and practices responsibility will reap the most benefits from this concentrated powder.